From left are Woodland Principal Kim Parsley, PWT President Dena Thomas, Mr. Charlie Heath and PTW Vice President Bud Nemeth. The Parents and Teachers of Woodland Elementary School (PTW) is proud to announce the completion of our honorary pavilion. 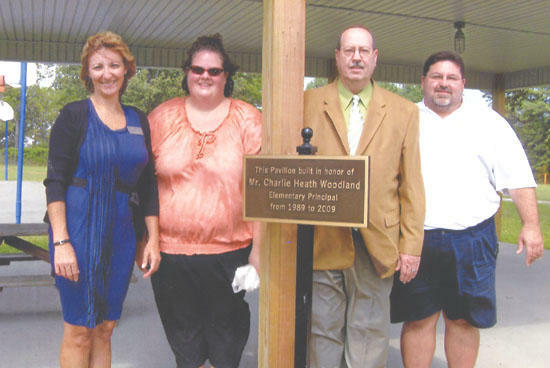 On Thursday, Sept. 16, 2010, we dedicated our new pavilion to Mr. Charlie Heath's 20 years of service at Woodland Elementary School. The 20 x 40 structure is a great addition to our playground. The PTW at Woodland voted last year to build this addition by using donations and fundraisers. Our outdoor pavilion will provide students and faculty the option of outdoor classrooms and assemblies as well as an outdoor facility for the community. We would like to say thank you to all who helped in our fundraising and all who made donations. A special thank you to Chris Underwood for doing a wonderful job of constructing our pavilion with such perfection.